for $575,000 with 3 bedrooms and 1 full bath, 1 half bath. This 1,520 square foot home was built in 1955 on a lot size of 0.4600 Acre(s). Welcome to 8 Newall Terrace - a renovated ranch situated on just under a half acre on a dead-end street. Just minutes to Misquamicut State Beach and historic Watch Hill - this is a perfect beach house. Relax or entertain on your oversized deck offering a glimpse of the Atlantic Ocean while the sound of waves crashing in the distance can be heard. 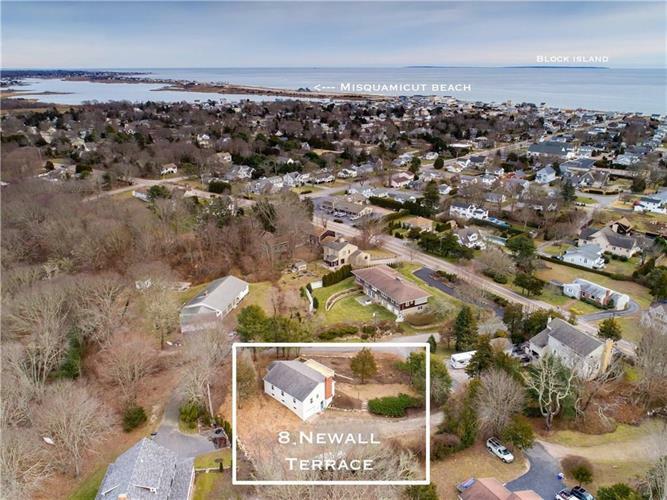 An outdoor shower, oversized tandem garage (perfect for storing all your beach gear) and lower level full bathroom with a laundry area are just a few more reasons that make 8 Newall Terrace an ideal beach house. Upstairs is highlighted by a long, open concept living space that faces south and is drenched in natural light. The updated kitchen flows nicely to outdoor spaces - the aforementioned oversized deck or a cozy covered porch. Back inside, hardwoods run throughout the entire upper level and lead you to a 3-bedroom wing on the rear side of the home. This wing is equipped with a nicely renovated full bathroom offering a tub/shower. Come check out this truly turnkey home and see all that it has to offer.